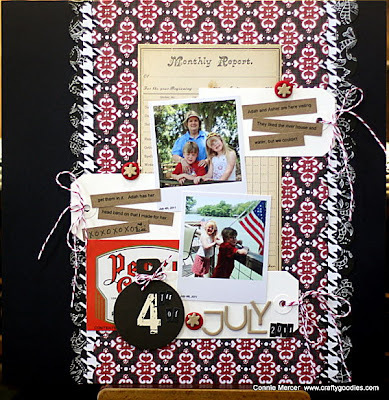 crafty goodies: 4th of July~red and black!! 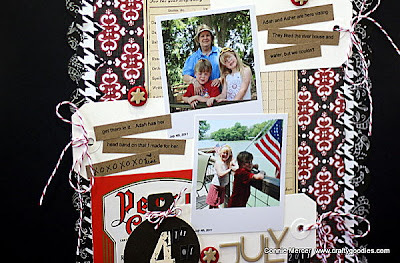 This is a new take on 4th of July~using black and red instead of blue and red. The paper is Paper Studio and was submitted to the Hobby Lobby magazine but was not picked up. The re-production ephemera is by 7gypsies. And last a close-up of some super cute kids:):):) ~ Have a great Holiday weekend. We will be traveling but I will be around and hoping for some major junk'in !!! Sorry this didn't get picked up, Connie. It's a great page. Love the tags! this page is amazing.. i love that paper you used.. sorry it did not get picked for the mag.. they should have because it is awesome.. This is gorgeous!! LOVING the colors and the tags!! Can't believe it wasn't picked up - that is sooooo awesome and totally pops!!!. Could've used you on my junkin experience. LOL!!! This is beautiful. I would submit elsewhere. To good not the share everywhere.